Gunnar receives a strange phone call from his ex-boyfriend, Einar, months after they parted ways. Einar sounds distraught, like he's about to do something terrible to himself, so Gunnar drives to the secluded cabin where Einar is holed up and soon discovers there is more going on than he imagined. As the two come to terms with their broken relationship, some other person seems to be lurking outside the cabin, wanting to get in. 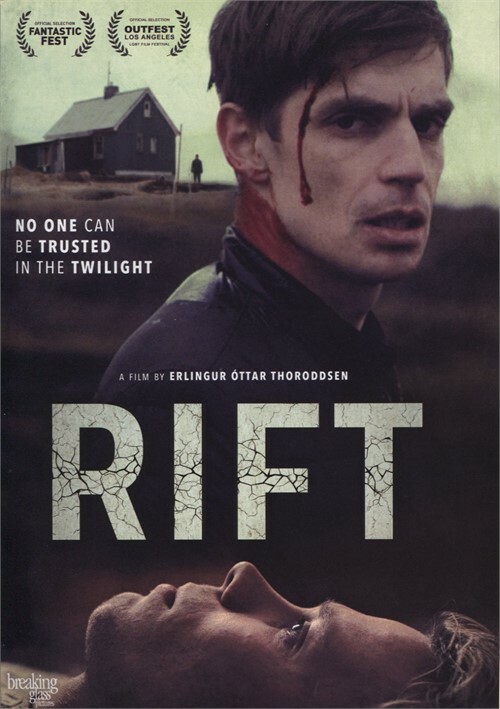 Rift is an enticing, well-acted and expertly-directed mystery-thriller that will make the hairs on the back of your neck stand up. Paying homage to classic horror films like Robert Wise's The Haunting and Nicolas Roeg's Don't Look Now, this film is genuinely suspenseful. The Movie has proven a big hit on the film festical circuit - not just LGBT film festivals, but general horror film festivals as well, where it has earned rave reviews. Edgy, creepy and atmospheric - there's shades of The Sixth Sense and Hitchcock here. In Scandinavian fashion, the plot is a simple premise but also a bit open to interpretation. If you can respect films that don't spell everything out for you, you'll be intrigued. The acting, cinematography and score are polished and top notch. I was engrossed; though I watched this on an early summer day at 95 Fahrenheit, I felt transported to Winter in Iceland. Highly recommended, if you can be patient with a "slow burn" plot and enjoy films that leave you with questions. On a side note, I found the subtitles to be excellent - no problems. Interesting if unsatisfying story. Lots of plot threads none of which were resolved. Good acting. Good production values. Biggest technical problem was the subtitles. 1) They're too tiny to read easily. 2) The white lettering frequently disappeared against light images caused me to miss out on large chunks of dialogue. When Gunnar gets a late night phone call from his ex-boyfriend Einar he becomes concerned and with good reason. Einar sounds disturbed and capable of hurting himself so Gunnar goes to the secluded cabin where Einar is holed up and quickly learns that someone, or something, is stalking them both. At this point, the film becomes quite intense and we begin to guess about what is going on. I had a sense of dread as I watched and this is because I had no idea of what to expect. Icelandic "Rökkur" (or "Rift") is about two men whose relationship has ended but who still deal with memories of the love that they once shared. Director Erlingur Thoroddsen gives us a condensed story of love, loneliness and betrayal set in the spooky atmosphere associated with Iceland, where fifty percent of the population is said to believe in elves, ghosts and goblins. Everything in the movie backs this up. This is a movie with questions and no answers yet we are okay with that. We look at the complexity of relationships and the ambivalence that urban dwellers feel about nature and we see our inner demons that come to the fore as we watch. I found it to be stimulating to wrestle with the questions about what is real and what are the characters' (and even our own) fantasies.